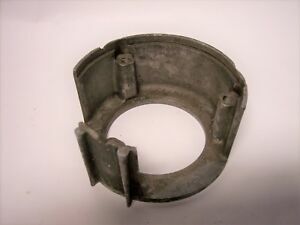 I'm looking to install a 67-style alternator bracket to a case that has the multi-stepped studs. Is it do-able? It seems that the 67 cases have a bit more surface for the bracket to sit on, but otherwise the parts fit. Also, why is the stud tapped for two different sizes at one end? Does the bracket take a nut, then the stator sit against that? Why not have the stator nut also hold the bracket in place? Does anyone have a good picture of this setup? I was contemplating doing the same thing with my 64 im building. Following to see what people say. No responses yet, but I can't imagine it would do anything but help things out. It seems that the three self-standing studs have more potential for flex, that could cause contact between the rotor and stator. But that's just a theory and I might be over-engineering a solution to a non-existent problem, apart from protecting the cases from a loose chain. Without looking at a set of cases that used the alternator support, memory says the cases were machined for the support to sit into the case. A standard 3 stud case wouldn't be machined. I have run later cases with the support and early cases without. Do a good job at assembly making sure the gap on the alternator is consistent all the way around the stud arrangement works. The cup that was added to support the alternator or the cases with the alternator support cast in just reduce effort to install the stator since you are somewhat fixed in there the stator ends up. I have run later cases with the support and early cases without. To install the bracket on the studs, is there a nut between the stator and the bracket, on the bigger portion of the stud? Hard to tell from the parts manual. After watching this video from Lowbrow Customs about putting the primary together on a triumph, I actually feel a bit better about just running the multi-stepped studs. As long as I keep the parts in good working order, I guess it's not as big of a concern as I originally thought.